So I’ve been back in Beijing for a week now. It’s been… a lot of things, but overall, good. Manda and Andrew drove me up to Sydney last Sunday and after dinner with my sister (she made such good food!!) Trina played navigator and we headed over to Ram’s. I hung out there with him and his flatmates for two nights (including some good cooking, some friends driving down there to say hi, and some late night jamming) and then got on a plane Tuesday afternoon. A few hours into the flight my head tried to explode – courtesy of the cold I picked up in Canberra before leaving… I soon discovered that codeine and constant nose-blowing kept the head-pressure at bay! I did okay the rest of the way. This week has been full of errands, getting the house (and my life here) in better order. Trips made to and from markets and fruit stands, a visit to the local police station with Bec when she registered at her new address (here! ), shoes and bags taken to the guy outside the front gate to be mended, odds and ends left behind by various friends thrown or given away, friends’ new apartments visited, spices consolidated, meals cooked, keys for 3 apartments cut, warm weather adjusted to, sore arms stretched, furniture rearranged, breakfasts eaten every day, photos from home uploaded to facebook, and i’ve even unpacked my suitcases and put them away in the balcony cupboard! Work wise, I have a few weekly singing lessons set up, and I’m hoping to get a bunch more set up in the next month. My flatmate is currently singing five nights a week at a hotel/spa place down near the temple of heaven. She’ll be home in September and I’ve agreed to do three nights a week while she’s gone. It’s two 45 minute sets with a guy who sings and plays from midi tracks on his keyboard. There’s an hour bus trip each way, but the money ($50 a night) will pay the rent! Plus it’s a pretty low pressured environment to practise performing in. So what else should I tell you? Adjusting to summer again has been easier than I’m used to. I usually find it harder going to summer rather than to winter. But then again, I suppose I usually come back to Beijing in winter…maybe it’s coming home that makes it easier. The adjustment for my arms is harder – they always struggle in the warmer weather – but I’m getting through alright so far. I’ve come back to the most pleasant part of the year – autumn is about to start, with the wonderful weather it brings. Autumn is the best time of year in Beijing. The days are warm but not hot, there is often a little breeze, and the humidity is bearable. The skies haven’t cleared up yet, but that usually happens on the 1st of September – so here’s hoping! 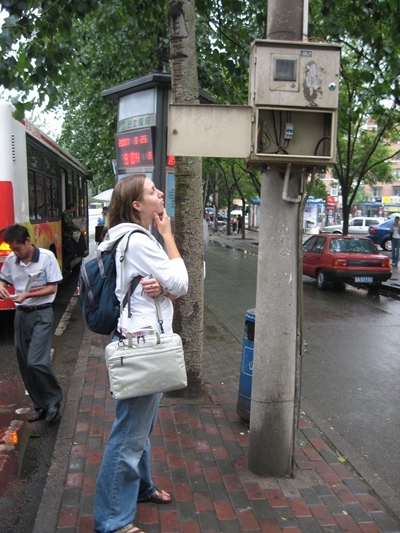 August 29, 2007 in China Stories.